Carlson Insurance Agency was started by Jerry Carlson in 1986 as a Farmers Insurance Agency, In 2009 it became a family business and an independent agency writing with many different companies in order to give our clients the best possible service. ​As an independent agency, we are able to compare your insurance needs among all our companies to find you the best possible rate. No need for you to hassle with multiple agencies to find the best deal. We will be able to find you the best deal and write it all in house. We have been members of this region for 30 years and through that time we have become a strong pillar of the community. We consistently help provide support for Coats for Kids, Kootenai Humane Society, Wounded Warrior Program, Altar Church, as well as supporting many of the local schools. 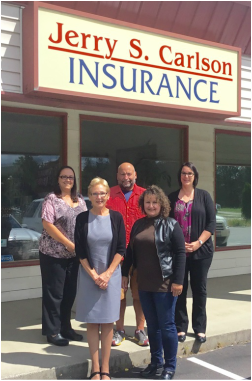 Carlson Insurance Agency is also a member of the Coeur d'Alene Chamber of Commerce.